George Stephanopoulos to co-host Good Morning America: A bad move? 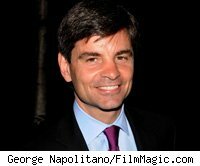 At some point on Thursday, ABC News will announce that George Stephanopoulos will replace Diane Sawyer as the co-host of Good Morning America when Sawyer becomes the anchor of World News Tonight. If you have trouble picturing the former Clinton aide and current host of This Week as a chatty, bubbly morning-show personality, you're not alone. According to Politico, even Stephanopoulos's friends "seem baffled by his decision to take a job that doesn't seem like a natural fit." In fact, his decision is baffling on several levels. In This Week, Stephanopoulos has one of the plum jobs in TV journalism -- one many thought should have gone to a more experienced journalist and/or someone without a background in partisan politics. But Stephanopoulos has proved a more than able interviewer, and under him This Week has scored some notable ratingsvictories over Sunday-morning Goliath Meet the Press. Maybe, after seven years, Stephanopoulos is ready for a new challenge. And there are some undeniable perks to hosting GMA. The money is sure to be much better -- Sawyer reportedly made something north of $12 million -- and New York certainly beats Washington as a place to live. But it also has a pretty significant downside: the grind of getting up at 4 a.m. and producing 10 hours of live TV a week (15 if you count Good Morning America Now, the third hour that airs only on ABC News Now). One suspects the real allure of GMA in Stephanopoulos's eyes lies in what he envisions coming after it. Thanks to Katie Couric, Charles Gibson and now Sawyer, the morning show is well established as a stepping stone to the ultimate plum, the evening news. Stephanopoulos is surely thinking that it's only a matter of time now before the 63-year-old Sawyer retires, leaving him the obvious choice for World News Tonight. No doubt he's right about that. But that kind of thinking is a relic of a bygone era. Evening newscasts still have massive audiences, but they are almost totally lacking in influence. In the rare instance that something broadcast on the 6:30 news has an impact -- I'm thinking of Couric's jaw-dropping interviews with Sarah Palin -- it's because the clip gets picked up, recirculated, embedded via YouTube on other websites, mocked on The Daily Show, etc. Otherwise, the evening newscasts are just ultra-disposable commodity content. Stephanopoulos already has a platform from which he can conduct the kind of news-making interviews that everyone else will spend the rest of the week talking about. And he doesn't even have to wake up at 4 a.m. to do it.